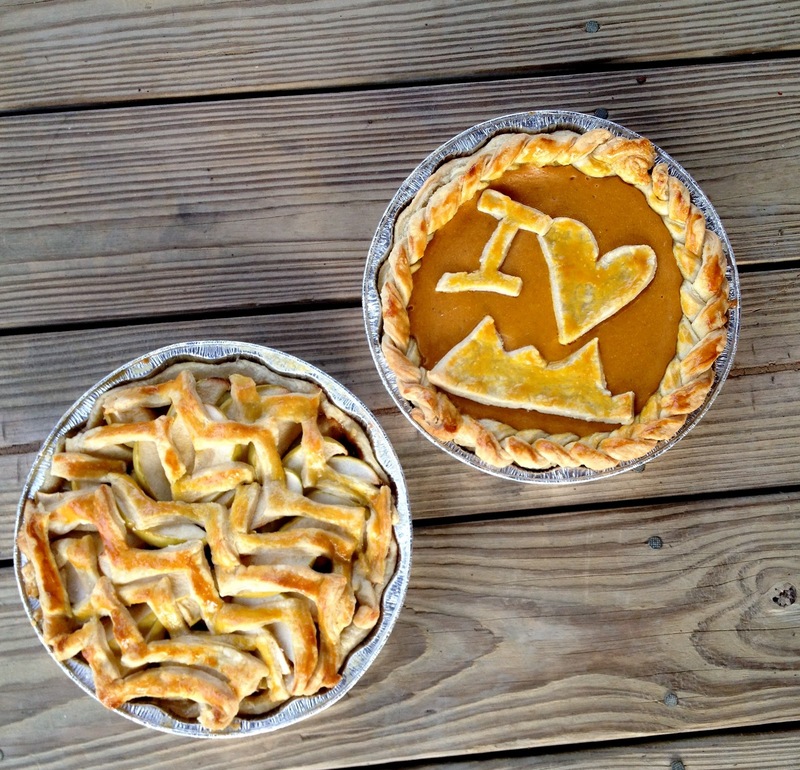 For the sixth year running, nestled in the mountains of Southwest Virginia, a little bit of pie magic was taking place. The town of Blacksburg, Virginia had its annual pie auction. Six years is a long time for a college town like ours, but the auction seems to have grown in popularity every year, probably due to the combination of outstanding pies and good causes. The auction works like this: volunteers bake a bunch of beautiful, creative, delicious pies and bring them to the location, a popular restaurant downtown. People come in, eat dinner, admire the pies for a bit, and then the magic happens: our wonderful auctioneer starts the bidding. 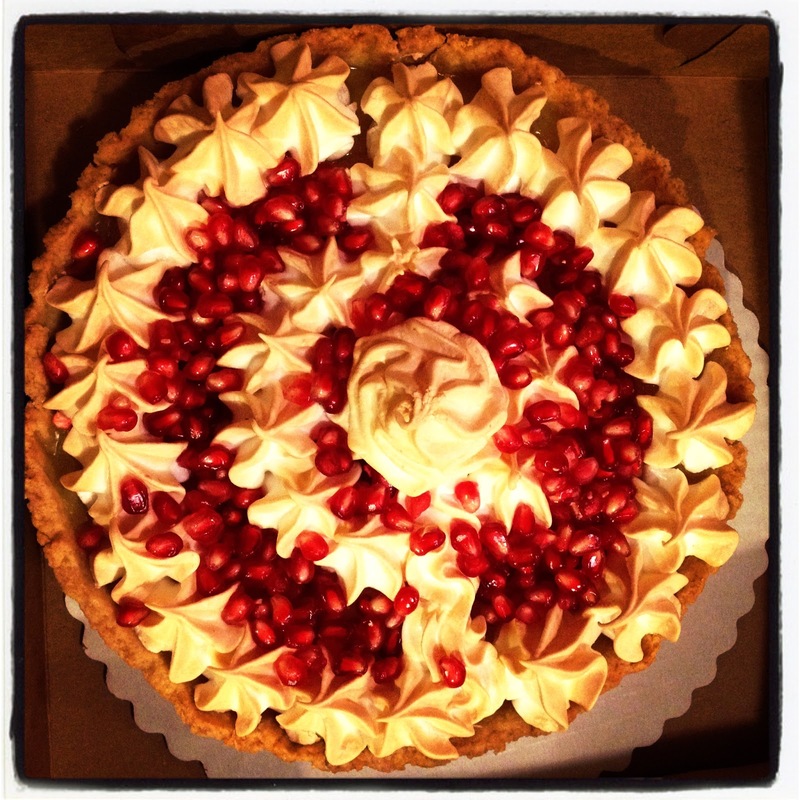 People go nuts, compelled by generosity, friendly competition, and a craving for dessert. The bidding starts anywhere from $10- $20, and pies have sold from $20 to even $100. Sometimes its obvious why some pies go for so much, like the deer heart mincemeat pie, from my friend's first hunt, or the professionally baked lemon meringue and pomegranate pie. Sometimes it's by pure supply and demand: the only pecan pie went for a killing. And sometimes, it's just the energy in the room: people outbid their friends, outbid their enemies, and outbid themselves in the heat of the moment. 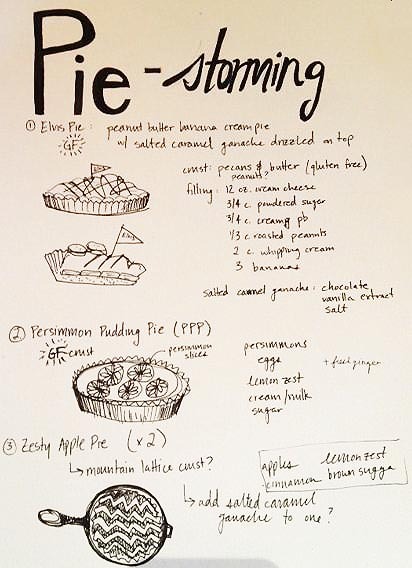 I contributed four pies, which took most of the day to bake. First I made two gluten free pies, which involved pre-baking pecan and butter crusts. 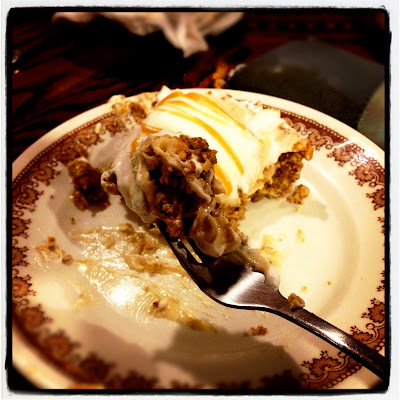 The filling was based on the Nothing in the House recipes for Elvis Pies: it had cream cheese, peanut butter, a little sugar, some peanuts, and whipped cream folded in. I layered the crust with banana, then the chilled filling, then more whipped cream, and topped it off with a salty caramel sauce drizzled on top. I also made a zesty apple pie, with lemon zest, granny smiths, a bit of fresh ginger, and honey in the filling (plus some salt, sugar, and cinnamon), was the next pie. Rather than the usual lattice crust I would have done, I decided to spruce it up with a zig-zag chevron pattern, reminiscent of the mountains we all love! I also made a ginger-pumpkin pie, which is your basic pumpkin pie filling with condensed milk and pumpkin, plus a bunch of freshly grated ginger. I made these pies with an all butter crust recipe which I always use, and an egg wash to make it golden brown in the oven. My recipe is simple and pretty imprecise: about 1 1/4 cups of flour to 10 tablespoons of butter (salted is fine, or if you use unsalted, just add a teaspoon of salt), and as little water as possible to get it to all stick together. Especially for the auction, it's important for pies to have visual appeal, so I fancied them up with a braided crust and "I heart mountains" decorations. Over thirty pies were contributed to the auction. It was hard to pick my favorites, there were so many! 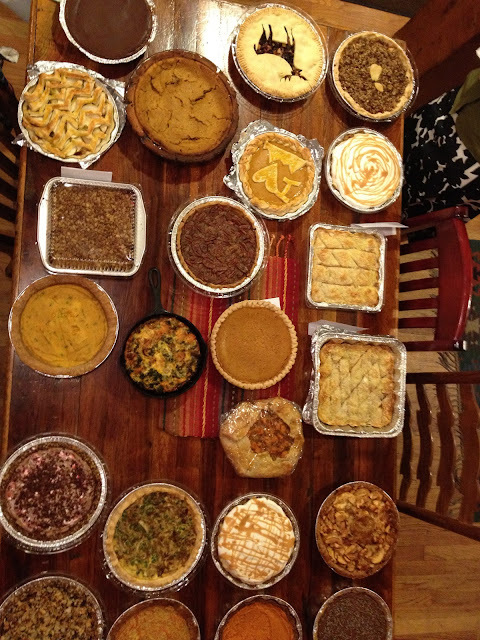 Many of the pies were gluten free, some were vegan, and some were even meat based. They ranged from lavender chocolate, to cardamom carrot, to ginger pear, to venison pot pie, and good old fashioned apple. The spread was simply beautiful. And best of all, we raised over $1,200 for two wonderful organizations. 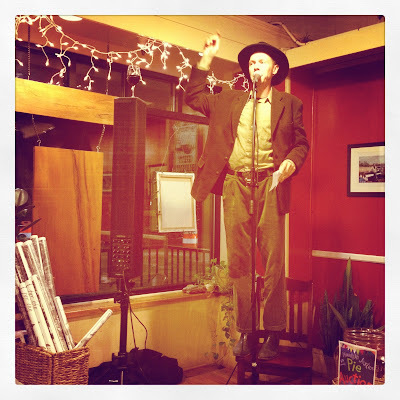 The RReNEW Collective, which stands for Remembering and ReEngergizing Neighbors Economies and Watersheds, works to help place volunteers in organizations working for a sustainable Appalachia in the coal dependent region of Southwest Virginia. They support and initiate projects and organizations that promote healthy environments and just communities, and do wonderful work. The other organization is the Black Mesa Indigenous Support Group, which is committed to supporting Indigenous peoples of Black Mesa, Arizona, and their resistance to massive coal mining operations and force relocation policies. Both organizations are connected to the fight against mountaintop removal coal mining, and both are smaller organizations where the money we raised can go a long way. So come on down to Blacksburg next fall, where there's sure to be even more pies, good bidding, and an overall wonderful time! 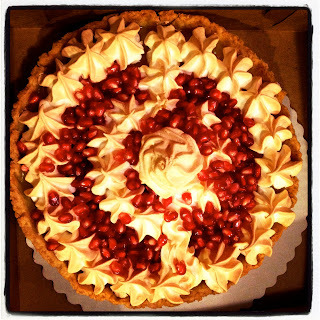 So many gorgeous pie designs! And a pie auction? So fun!